The scorching heat is not the only reason for the raging forest fires that are engulfing the rainforests at Phu Long mountain in Chaiyaphum province. The more serious threat is from poachers who use fire to hunt wildlife. Despite the reforestation efforts by monks and villagers, the Phu Long forests still face fires caused by poachers every year. Photo courtesy of the DEK RAK NOK CLUB. Phu Long is the rain catchment forest of the Lampathao River, the lifeblood of countless communities downstream. It used to be one of the most fertile rainforests in the region, but the government's logging concessions and its policy to expand farmland on the frontiers have caused massive forest destruction here and elsewhere. Over the past few decades, the Phu Long forest has recovered significantly, thanks to a strong Phu Long forest conservation movement led by Buddhist monks and nuns. 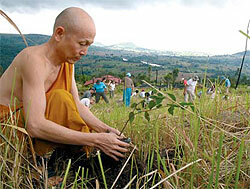 For the past decade, Phra Paisal Visalo, a reformist monk and abbot of the Phu Long forest monastery, has been organising Dharmayatra, a religious pilgrimage to cultivate forest conservation awareness, leading to a community network to safeguard Phu Long. But the wildlife that has returned to Phu Long has also attracted the poachers who are backed by powerful people. They set the forest ablaze as a method to force wild animals to flee into their traps. The fires are often uncontrollable and cause massive damage. At present, villagers have set up a team of forest guards to patrol the forest around the clock. Yet, they cannot keep up with the poachers' trickery. Often the villagers must work shoulder to shoulder with people from the temples to douse the forest fires both day and night. The fight is on to save the forests at Phu Long, Chaiyaphum. The forest guards need help. They need sneakers to do their forest patrol because combat shoes are too heavy and make too much noise on dry leaves, which alerts the poachers. They also need binoculars and digital cameras. It helps to be able spot poachers from afar, and since the forest guards often cannot get close to them, it helps to have their pictures so they can be arrested in the future. Ban Vithee Thai, 7 Moo 11 Tambon Tamafaiwan, Kaengkroh district, Chaiyaphum 36150. For more information, call Neng at the Lampathao River's Rain-catchment Forest Recovery Project on 08-4925-4800. - FOREST CONSERVATION: Starting as a reforestation project, conservation work by the Rabbit in the Moon Foundation has now branched out to create community employment as well as cultivate forest conservation among the younger generation, since deforestation is, more often than not, the result of state policies and urban lifestyles that are beyond the control of local villagers. More information about the foundation in Thai and English is available at http://www.rabbitinthemoon.org, or call 02-513-9767 or 02-513-9686. To help, you can volunteer time and energy, support the foundation's various products or donate to: savings account name: Mool Nithi Kratai Nai Duangjand; a/c No: 103-4-016111, Bangkok Bank, Yannawa branch. - VOLUNTEERS: The Volunteers for Nature Network wants volunteers to help build forest fire barriers at the Huay Kha Khaeng Wildlife Sanctuary in Uthai Thani province on March 21 and 22. The network is an initiative by a group of 2004 tsunami volunteers to keep up the spirit of volunteerism. Volunteers are also asked to contribute 950 baht for transportation and food during the trip. For more information, call 08-7177-4647 or 08-1481 1496. - STRAY DOGS: Dogchance is a non-profit organisation with a mission to help Bangkok strays through free neutering and immunisation. Volunteers will collect the strays and make sure they are safe before returning them to their neighbourhoods. The dogs will also receive anti-rabies vaccinations as well as other treatments for worms, ticks and skin problems. To help, or for more information, email pymberly@hotmail.com, call 02-258-7097 or visit http://www.dogchance.com.